In a resounding validation of excellent air cargo services it offers to customers, Emirates SkyCargo won the Cargo Airline of the Year award at the Global Freight Awards ceremony organised by Lloyd’s Loading List, a renowned freight publication. 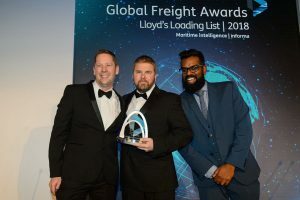 The award was accepted by Ross Barnett, Emirates Cargo Manager, UK, at the gala dinner held on 16th November at the Royal Lancaster London in front of an audience drawn from the global freight and transport community. F or the sixth consecutive year, Emirates SkyCargo won the award for the Best Cargo Airline- Middle East, Asia and Pacific 2018 at the awards hosted by Transportes e Negocios, a leading transport publication in Portugal. 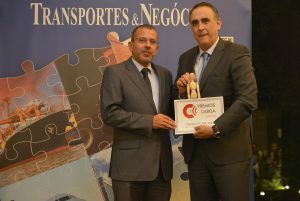 The air cargo carrier has been facilitating international trade between Portugal and the rest of the world since 2012 by transporting export commodities such as electronic equipment, automotive components, footwear, textiles and clothing from Lisbon in the belly hold of its now double daily Boeing 777 passenger service. The air cargo carrier operates a modern fleet of all wide-body aircraft including 256 passenger aircraft and 14 dedicated freighter aircraft. Emirates SkyCargo has invested in two state of the art hubs in Dubai – Emirates SkyCentral DXB for belly hold cargo from passenger aircraft and Emirates SkyCentral DWC for main deck cargo from freighter aircraft. The terminals also include extensive temperature controlled storage areas as well as GDP certified dedicated zones for the storage and transport of temperature-sensitive pharmaceutical shipments. Emirates SkyCargo is the world’s largest international cargo airline and in 2017/18 it transported a total of 2.6 million tonnes of cargo.